I do. That combo of sweet banana and rich PB made that squishy, soft sandwich something to look forward to. I never traded my precious sandwiches with anyone, not even for Gushers or Kudos bars (helloooo, 90s snackage!). What’s one way to improve upon something already awesome? By dunking it in chocolate, of course! The secret to getting the creamiest homemade frozen treats lies in the preparation and ingredients. Using a food processor to blend up the frozen bananas gives these bars a soft, biteable texture. A pinch of xanthan gum, which you can read more about it my e-cookbook, minimizes iciness in the sweet n’ creamy banana filling. 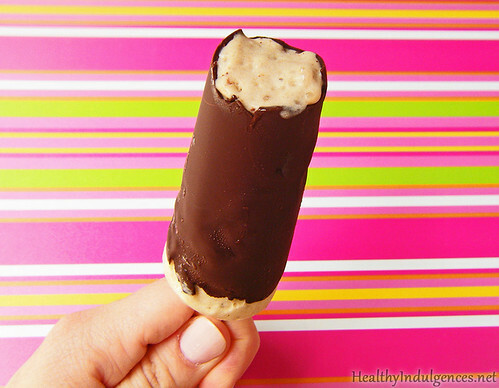 These tasty treats are dairy-free, vegan, and low in sugar compared to store bought fruit bars. They can easily be made paleo by replacing the PB with almond butter. This is the type of homemade dessert that is ideal for students like myself since it’s budget-friendly, with its short list of ingredients. All of the ingredients for this recipe were purchased at Walmart, aside from the NuNaturals liquid stevia. If you replace the liquid stevia with stevia in packets (like this one), you can pick up all of the ingredients in one fell swoop at your local grocery store. Since you guys have asked me about liquid stevia so many times, I’m starting to incorporate it into a few recipes. You can find out how to use powdered stevia on the blog, and in my e-cookbook. The one drawback of using liquid stevia in recipes, versus the powdered stevia used in most of the recipes on this blog, is that the sweetness of liquid stevia doesn’t seem to be standardized between brands. That’s why I hesitate to recommend using a conversion chart to replace powdered stevia extract with liquid stevia extract. There are far too many stevia products out there to make a sweeping recommendation! The liquid stevia I received from NuNaturals is perfect for use in coffee, yogurt, and other on-the-go treats. It’s so easy to whip out the dropper bottle as you’re runnin’ out the door! No need to mess with spoons. Scroll down to the bottom of this post to see how you can WIN some NuNaturals liquid stevia! 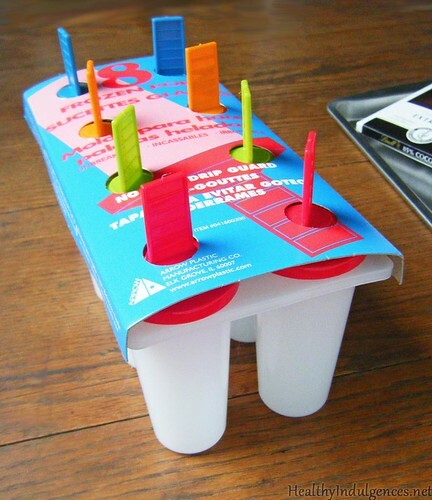 Found popsicle molds at Walmart in the summer specials section for $1.50. Totally worth it! 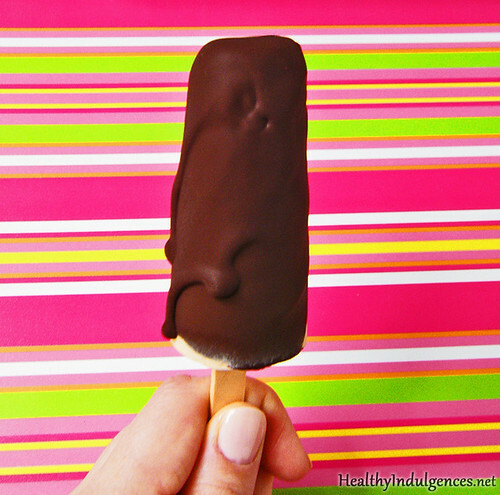 The raspberry version of these pops, all gussied up in its chocolate coating. In a small, microwave-safe drinking glass or bowl, break up chocolate bar into chunks. Add coconut oil and stevia. Microwave on HIGH for 30 seconds, then stir. 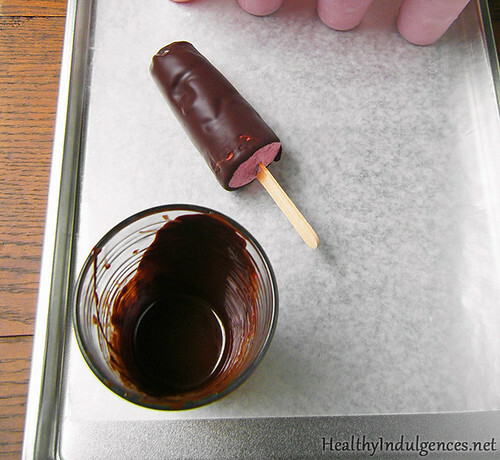 Continue to microwave chocolate mixture for 15 second intervals, as needed, until liquefied. Four winners will win prize packages consisting of two (2) bottles of orange– and lemon-flavored stevia from NuNaturals. You’ll get to try one bottle of each flavor! The winner will have to provide their address to receive their prize package, shipped from the company. To enter, share this post on Facebook, repin it on Pinterest, or Tweet about it. You’ll receive one entry for each share! Leave a comment with the links to each of your shares, and leave your email address (spaced out like this –>healthyindulgencesblog @ gmail . com<– to prevent spambots!). shared to facebook. can’t wait to try these! I shared with my daughter, plus saving this recipe. You are amazing. Pinned it and tweeted! Love your blog! Love your style!!! Thank you, Natasha! What a nice comment. Looks so good! !Would love to try the stevia!! would love to win stevia!! https://www.facebook.com/NicoleDavidsohn <Posted on my business page! These look delicious! I can't wait to make them. No problem, Penny! It’s a joy to make treats with and get inspiration from the wonderful community of readers at this blog, and around the web. 😀 Let me know if you try the frozen treats! Yep, totally shared on Facebook!!! YUMMY!! Can’t wait to try these! How much is exactly a big pinch of xanthum gum? I happen to have some in the pantry! I shared on my FB page. oh I want it now. Am I too late for the giveaway? And shared it on Facebook. Shared on FB – your recipes look awesome! Shared on FB and Pinterest!